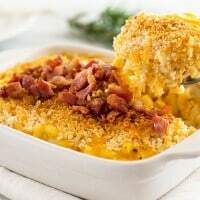 This smokey, creamy Bacon Butternut Squash Mac and Cheese for Two is made with butternut squash roasted in bacon drippings, crunchy panko, and sharp Cheddar cheese. Preheat oven to 400°F, line a baking sheet with foil and lightly grease with cooking spray. Put water on to boil for the pasta. In a medium pan over medium heat, cook bacon until crispy. Remove bacon from pan and transfer to a paper towel-lined plate. Add squash to the pan and toss in the drippings until well-coated. Pour squash out onto your prepared baking sheet and bake for 15 to 20 minutes, until tender. Cook your pasta according to package instructions, drain and set aside. Crumble or chop bacon into bite-sized pieces. While your pasta cooks, puree roasted butternut squash in your food processor or blender. Add 1/4 cup of the milk and puree until smooth. In a medium saucepan, over medium heat, melt butter. Whisk in flour and cook until golden brown, about 30 seconds. Whisk in milk, stirring constantly so no lumps form. Continue to whisk mixture for 3 to 5 minutes, until mixture thickens and begins to bubble. Stir in pureed butternut squash and 1/2 cup of the cheese. Salt and pepper to taste and add (just!) a pinch of ground nutmeg and rosemary. Stir in 1/2 of the bacon and the prepared noodles. Transfer mixture to a greased 7x5-inch baking dish. Top with the remaining cheese followed by the panko. Bake for 12 to 17 minutes or until cheese is melted and panko crunchy and golden. Top with remaining bacon and cool for at least 5 minutes before serving.